The EFMC’s communication team has been established to help promoting Medicinal Chemistry and Chemical Biology in Europe and around the globe, with the aim to create a shared network, and inspire young future scientists. Chiara Borsari is a medicinal chemist, working as postdoctoral fellow at the University of Basel (CH) in the group of Prof. M. Wymann. Her research is focused on the design and synthesis of small-molecule anticancer agents. Her main goal is the development of irreversible inhibitors as a novel strategy in targeted cancer therapy. She got her PhD at the University of Modena and Reggio Emilia (IT). During her PhD, she has joined the NHRF in Athens (GR) and the State University of New York at Albany (USA), where she worked on phospholipids and polymersomes synthesis. She is also keen on communicating her science to the public. In 2019, her short movie “Life in Colour”, explaining the advancements in cancer research, has won the Jury Prize at the Exposure Science Film Hackathon. She has joined the EFMC communication team to boost the awareness of the importance of Medicinal Chemistry in science. 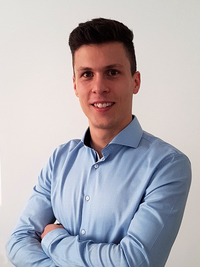 Matic Proj is a recent graduate, currently working as a Medicinal Chemistry Researcher at the Faculty of Pharmacy, University of Ljubljana, Slovenia. His research is focused on the design, synthesis and chemical analysis of novel organic compounds as potential enzyme inhibitors. Matic is active in a national Pharmaceutical Students’ Association, working as a Public Relations Representative. As one of the youngest members of the team with a great passion for science, he contributes his ideas, computer and social media skills. He has joined the team to gather new knowledge and experience, while promoting the field of Medicinal Chemistry and facilitating communication. 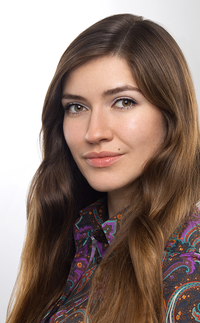 Tamara Šmidlehner obtained her PhD in Medicinal chemistry in 2018 at the Ruder Boskovic Institute, Zagreb, Croatia. Her interdisciplinary PhD research included synthesis of novel cyanine-based molecular sensors for recognition of differently structured double stranded-DNA/RNA and proteins. The recognition is based on highly selective fluorescence response triggered upon formation of supramolecular complexes with biomacromolecules. These noncytotoxic molecular sensors showed as highly specific fluorescent mitochondria stains, but also as novel probes for monitoring β-amyloid fibrillation process in fluorescence assays. Thanks to the different scholarships she visited several foreign laboratories (Warwick University, UK; University Grenoble-Alpes, France, University of Parma, Italy) where she has done part of her PhD research and obtained valuable experience in different spectroscopic techniques. Matt Tozer is an independent medicinal chemistry consultant, who works with clients across the research & development and service sectors. Notable recent collaborations have included: the University of Sheffield on a substantial small-molecule oncology programme; Cyclofluidic on its AI-driven, integrated discovery services; and Ubiquigent on its DUB-inhibitor platform. Matt has a wealth of experience of leadership and management in the biotech and contract research sectors. As Director of Peakdale Chemistry Services, he was Head of Site for Peakdale’s pioneering embedded unit at Pfzir, UK. In parallel, he was Peakdale’s Director of Medicinal Chemistry Services. He was Director of Medicinal Chemistry UK for the Anglo-Swedish biotech Medivir and is proud to have earned his spurs as a medicinal chemist under the aegis of Sir James Black at the James Black Foundation. Matt is an active and dedicated contributor to the Royal Society of Chemistry, notably through the Biological and Medicinal Chemistry Sector and the Organic Division. He is a member of the Executive Committee for the European Federation for Medicinal Chemistry. He is too old to know much about social media, but cuts, pastes and presses buttons with youthful enthusiasm. Mary Wheldon works as a medicinal chemist within the Drug Discovery Unit at the University of Dundee, UK. This is involves work on very early drug discovery projects, synthesising compounds, investigating targets and proof of concept work. I previously worked at University College London, within the Translational Research Office Drug Discovery Group, doing a 2-year structured postdoctoral training program. I had the opportunity to work with large and small pharmaceutical companies and in academia. Before this, I studied for my PhD at the University of York with Prof Peter O'Brien on the design and synthesis of 3-D fragments. The thing I enjoy the most about my job is having an impact (even if small) on the health and well-being of the World’s population. Lorenzo Botta is Lecturer at the University of Rome Tor Vergata. Since 2015 he is working in the Group of Prof. R. Saladino at the Tuscia University of Viterbo. The main focus of his research is the synthetic modification of bioactive natural products by the use of novel methodologies. He got his PhD at the University of Siena in 2010 working on the development of new methodologies for the synthesis of biologically active compounds endowed with HIV1 inhibitory activity. During his PhD he spent three months at the ETH of Zurich in the group of Prof. K.H. Altmann working on the synthesis of side chains for the Hypermodified Epothilone analogs and one year at The Scripps Research Institute (TSRI) of San Diego in the group of Prof. K.C. Nicolaou working on the total synthesis of natural products. 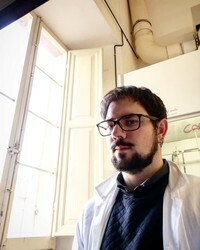 After his PhD he spent one year at the Columbia University of New York in the group of Prof. S.A. Snyder working on the synthesis of natural products and three years at the University Federico II of Naples in the group of Prof. E. Novellino working on the synthesis of small molecules as potential anticancer agents. Moreover, from 2016 to 2018 he was board-member in the Young Group of the Italian Chemical Society (SCI) representing the Division of Medicinal Chemistry. Fabrizio Giordanetto leads medicinal chemistry and drug discovery projects at D E Shaw Research. A trained medicinal chemist from the University of Genoa (M.Sc.) and University of London (Ph.D.), Fabrizio has over 15 years of experience in drug discovery and has delivered several clinical candidates in multiple therapeutic areas, resulting in more than 100 publications and international patents. Prior to joining DESRES, he directed the medicinal chemistry activities at Taros Chemicals. Fabrizio has also served as drug discovery Project Leader and Principal Scientist in medicinal chemistry at AstraZeneca after starting his industrial career at Pharmacia (Pfizer Inc.). 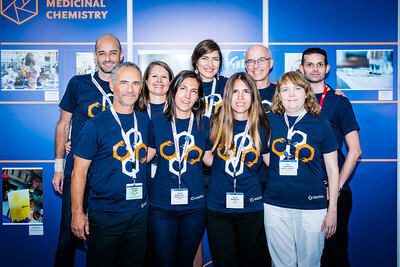 Fabrizio has chaired the “Visibility and recognition” working group of the EFMC, dedicating himself in raising the visibility and awareness of Medicinal Chemistry and the EFMC to the broader community and the general public. He is looking forward to continue this mission within the EFMC communication team. Kristina Goncharenko works in the business development team at SpiroChem, fine chemicals company based in Basel, Switzerland. Her main goal is to support medicinal chemists around the globe in designing drugs of tomorrow. She completed her PhD at the University of Basel in a diverse field: by combining biochemistry, biology and chemistry her project was focused on understanding the mechanism of a novel enzyme called sulfoxide synthase. Kristina is an active member of the Swiss Chemical Society and helps to strengthen the communication between pharmaceutical industry and young chemists. She believes that having a close network of medicinal chemists and chemical biologists will support innovation in science. Piia Kokkonen is a post doctoral researcher currently working at Loschmidt Laboratories. She got her PhD in pharmaceutical chemistry in 2015 from the University of Eastern Finland where she studied sirtuin inhibitors. The increased activity of sirtuins is associated with many health benefits and longer lifespan, but in her project she was only able to find compounds to inhibit their function. She has no intention to make people sick and live shorter lives, though, as also sirtuin inhibitors could be useful in the treatment of some health problems, such as diabetes or cancer. When moving to Czech Republic Piia moved slightly away from her comfort zone of drug design and started designing enzymes, as obviously it is not challenging enough to design small molecules. She is now working with haloalkane dehalogenases which can detoxify industrial waste waters and warfare chemicals. Soon she will start her Marie SkBodowska-Curie fellowship which focuses on the computational study of substrate inhibition and how one could engineer enzymes to avoid this problem. Piia joined the Communication Team to promote the slightly bizarre field of medicinal chemistry to everyone and because she enjoyed taking care of the social media communication during a conference she took part in organizing. Leire Iralde Lorente is a current final year PhD student on Medicinal Chemistry at the University of Siena (Italy) with a Marie Curie Early Stage Researcher grant (ESR). Her thesis project is focused on the design and synthesis of small molecules that could mediate their activity by modulating protein-protein interactions (PPIs) and their use as a novel class of therapeutic agents. More specifically, she is targeting the adapter protein 14-3-3 which by interaction with multiple phosphorylated protein partners plays a key role in the development of human diseases. Leire is passionate about the medicinal chemistry and joined the EFMC to help promoting this field. Michele Mari is a Postdoctoral Scientist in Medicinal Chemistry at University of Urbino Carlo Bo, He achieved his Ph.D. in Chemical and Pharmaceutical Sciences from the same university working on the strategic indole functionalization for the synthesis of tryptophan containing alkaloids and biologically active tryptamines. He spent 9 months at ETH Zurich as visiting researcher working on the total synthesis of proteins. In september 2017 he founded GLUOS (innovative Start up and University Spin off on the synthesis of molecules for medical devices) with some colleagues and he is actually the President of the Board of Directors of the company. 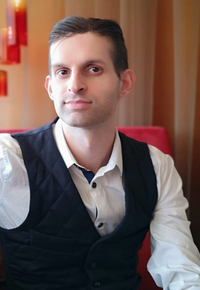 He is also member of the organizing committee of the European School of Medicinal Chemistry, and he is active locally in spreading the importance of soft skills and entrepreneurship vision. The driving force that makes him so active is an infinite passion for Science. Brieuc Matagne studied communication, marketing and political sciences at the University of Louvain, Belgium. Interested by the event planning world for a long time, he joined LD Organisation in 2014 as Conference Manager. In mid-2015, he started managing the Administrative Secretariat of the EFMC as part of his mission at LD Organisation. Since then, he is working behind the scene in helping running the daily business of the EFMC together with the Executive Committee Members. Lone non-scientist in this team of talented ones, he is using his expertise in communication and planning to assist the team in their mission to increase the EFMC visibility and brand awareness. Paula Morales is a postdoctoral fellow at the Instituto de Química Física Rocasolano at the Spanish Research Council (CSIC) in Madrid. In 2015 she obtained her PhD in Medicinal Chemistry from the Instituto de Química Médica-CSIC. Her thesis project was centered on the design, synthesis and evaluation of novel cannabinoid ligands. During a two year postdoctoral stay at the University of North Carolina she focused on the computational study of orphan GPCRs. She has co-authored 3 patents and over 25 peer-reviewed scholarly articles (https://orcid.org/0000-0002-6209-8600). Her passion towards Medicinal Chemistry comes from its intrinsic multidisciplinary nature. The possibility of identifying novel drugs to help fighting diseases fascinates her. She joined the EFMC communication team to help sharing, discussing and enjoying medicinal chemistry in a friendly atmosphere.